Ask Dr. K: What Causes Sleeping Problems in Children and Teens? Question: Why does my child have such a hard time getting to sleep at night? Answer: When children younger than five years have difficulty falling asleep or staying asleep, doctors call it Behavioral Insomnia of Childhood and it is caused by the lack of limit setting and the creation of behaviors intended to prolong the time awake rather than sleeping. Toddlers start asking for another glass of water, another trip to the bathroom or another hug. Some children associate going to sleep with a long ritual that includes the parent’s presence; holding, hugging or lying down with them. The onset of sleep is prolonged, making the parents tired and creating fear, now the parents are the ones who dislike the evening hours. Question: If my child does have Behavioral Insomnia of Childhood, will they get over it? Answer: By age 6-12, most kids are over the rituals of bedtime and are able to go through the transition to sleep without the parents help. When insomnia happens during this age, one must rule out anxiety and even depression as a cause. Click here for more information on sleeping guidelines. Question: Why does my teen have such a hard time getting to sleep at night? Answer: Adolescents who spend hours awake in the evening and later have difficulty waking up in the morning suffer from Delayed Sleep Phase Syndrome. They are never tired enough to initiate sleep in the evening and they engage in activities that keep the brain going, such as watching TV or playing video games. Schools are very aware of this phenomenon and it is the reason why most high schools start the day later than elementary schools. Question: What Can Parents Do? Answer: Managing sleep onset may very well mean the difference between happy evenings or irritability for most families. In the case of infants and young children, it becomes essential to create a short routine where the child is allowed to stay alone in her room during the onset of sleep, in the dark. Darkness increases the production of melatonin, a hormone responsible for the initiation of sleep. 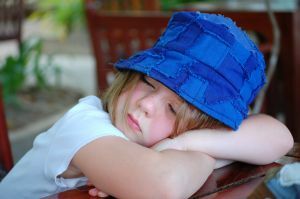 Young children do better when they have a routine so it is necessary to have a consistent bedtime, wake time and naps. Eliminate TV and other media activities within 60 minutes of bedtime and dim lights about 30 minutes before the desired sleep onset. Older children and adolescents, who need 8-10 hours of sleep at night, should be asked to go to bed with enough time to allow for the hours they need, but it won’t do any good to send them to bed at 8 PM if they don’t need to get up until 8 AM. Allowing them to stay up until 10 PM may be a better strategy for this age group. The same rule of darkness and eliminating video games and TV for 60 minutes prior to bedtime applies to them. Some adolescents are allowed to stay up very late during the weekends and they sleep late on Saturday and Sunday, staying up late again on Sunday night. By Monday morning they feel very tired and sleepy at school. Their sleep cycle is off during the whole week, impacting school and behavior. At any age, children need their parent’s guidance and limit setting. A rested family is a happy family!